When we first moved in, I bought a table and six chairs from a second-hand store. I love to re-finish things so they don't go to waste (and because they are cheaper, made better, and last longer). The table is solid oak, with a pedestal and claw feet. Apparently it's an antique. But it was in bad shape on the top and frankly I don't have oak in the house. I wish I had "before" pictures to show you but I did the table during the "my camera is still packed" phase of the move. I've talked a little bit about my "style" before. It trends toward shabby chic (just light on the shabby). Or Modern Vintage as one lady called it. Either way, I had a vision for my table and chairs. 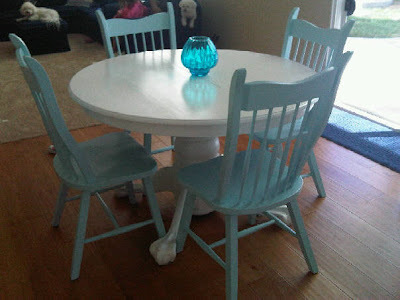 I wanted the table bright white (like our cabinets that I painted) and the chairs blue. Choosing the right blue was the hard part. We have a navy blue couch and cobalt blue glass all over the kitchen, so a darker blue made sense. But, I have plans to incorporate a lot more light blue/aqua into the space so I decided to do a pale aqua blue. Of course, as I was dragging the chairs out to the garage this weekend to paint them, my DH said, "You're painting them WHAT color?" Apparently I hadn't shared my vision with him. Later in the day I was watching HGTV (I'm a hopeless addict), and Genevieve of "Dear Genevieve" was talking about a couple that she was helping. She said that she was SO SURPRISED to hear that the couple had lived with their bedroom, unhappily, for 13 years but never talked to each other about how they each wanted it to look. In her words, they hadn't "shared their vision." Now, HGTV is probably an unlikely place to find deep relational meaning, but it struck me at that moment. If I haven't shared my vision of how I want our home to look, what else have I not shared my vision with DH about? Where do we see ourselves in five years? What financial goals do we have? Where do we want to retire? How much do we want to help the girls with college? How do we see ourselves dealing with aging parents? I know, they are just chairs. But maybe they will start a conversation that we haven't had yet. I saw that one too! Good point :) Your table & chairs look great! Those are good questions too. We like to give engaged couples a book that has tons of questions like that. You run in to fewer problems when you're on the same page from the beginning.